Hello everyone! It's Rita here. It's been one whole month since we last shared a recipe on the blog. We're never happy to have to take a break from blogging... but this time around, we had some pretty good reasons. Our first cookbook is out!!! It is called Vegan Para Todos (which translates to Vegan For All) and so far, it's been published in portuguese only. We're working towards publishing it in english as well and we're hopeful it will happen. We had had the dream to write our own cookbook for some time, but we could not have imagined it would happen so soon. Life tooks us by surprise, this time. Today we're sharing not one, not two... but three recipes! The temperatures are slowly but surely starting to rise here in the northern hemisphere and we're starting to feel like eating fresher, cooler meals. I don't know about you guys, but I could easily have sushi for dinner 2-3 times a week. André stands by it. I have to admit, these are not so much recipes as they are suggestions on what to stuff your maki and california rolls with. The truth is, we don't often make sushi at home... but when we do, it is a full blown celebration! We love sushi, and although it is one of the easiest foods to veganize, we have trouble finding good quality vegan sushi that is not sky-high expensive. At least, in our home town. Remove from the heat, take off the lid and cover the pot with a clean kitchen cloth. Allow to rest for 5 minutes. Transfer the rice to a wooden bowl, spread it out with a wooden spoon (do not use metal utensils at this point) and allow to cool down until it's cool enough to handle. Drizzle the sushi rice vinegar mix over the rice and mix gently, making sure all the rice is coated with the seasonings. Add all of the ingredients, except for the capers, to a high-speed blender or food processor and blend until perfectly combined and smooth. Transfer to a bowl (preferably chilled) and fold in the chopped capers. Keep the tofu cream cheese in the fridge while preparing the the other ingredients. Tip the rinsed and drained chickpeas into a deep plate and mash them with a fork until they turn into a thick paste. Add the water, lemon juice, mustard and sea salt and mix well to combine. Adjusting the seasonings and set aside. Grab your sushi mat (may or may not be wrapped in cling film) and place a whole sheet of nori on top. Dip your hands in water (to avoid sticking) and spread a thin layer of rice all over the nori sheet, apart from a 1.5 cm strip near the further edge (refer to photos). Spoon the sauce/cream/paste (if any) in a line across the portion of the rice closest to you and arrange the veggies and fruits on top. Pull the mat and roll the nori and rice over the veggies. Push the veggies into the roll with your fingers and roll the mat over to shape and tighten the maki roll. Place the shaped rolls in a shallow dish or tray and store in the fridge for 10-15 minutes. Use a very sharp chef knife with the edge dipped in water to slice each roll into 8 maki pieces. Wipe the edge of the knife with a clean kitchen cloth and dip it in water after every slice. Cut 2 nori sheets in half. 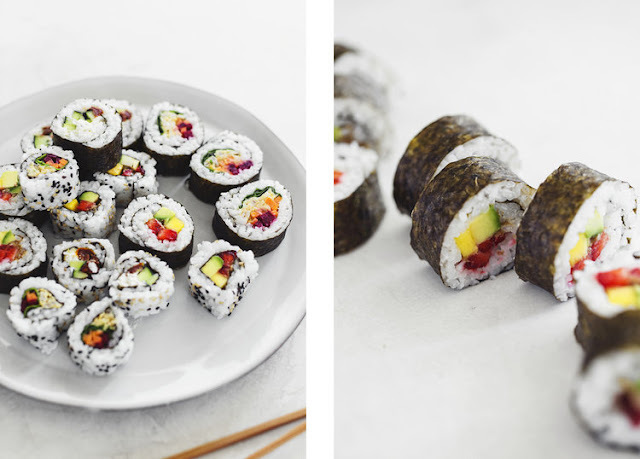 Grab your sushi mat (preferably wrapped in cling film) and place one half sheet of nori on top. Dip your hands in water (to avoid sticking) and spread a thin layer of rice all over the nori sheet. Sprinkle a generous dose of sesame seeds on top of the rice and carefully flip the whole sheet over. Spoon the sauce/cream/paste (if any) in a line across the portion of the nori sheet closest to you and arrange the veggies and fruits on top. Pull the mat and roll the rice and nori over the veggies. Push the veggies into the roll with your fingers and roll the mat over to shape and tighten the california roll. Use a very sharp chef knife with the edge dipped in water to slice each roll into 8 california pieces. Wipe the edge of the knife with a clean kitchen cloth and dip it in water after every slice. Serve straight away with pickled ginger, shoyu or soy sauce, and wasabi. Any leftovers will keep well if stored in an airtight container in the fridge up to 2 days. 0 Response to "EASY VEGAN SUSHI ROLLS (3 RECIPES IN 1) "